Quadruple bypass surgery is a procedure in which the blood flow is reestablished by redirecting it around the affected artery in the heart. Healthy blood vessels are harvested from somewhere else in the body in most cases from the leg and inserted in the arteries so the blocked part is bypassed and regular blood flow is established. 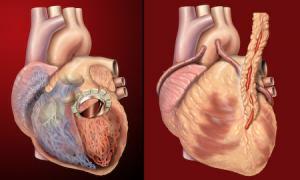 Quadruple bypass surgery means that there are four blocked arteries in the heart which need to be bypassed. Quadruple bypass surgery is performed in case of severe pain in the chest which is caused by narrow artery in the heart. Narrow artery can prevent the heart to obtain enough blood. If the artery is blocked due to some disease it can obstruct the normal blood flow in the heart. The causes for these problems are heart diseases and conditions. Bypass surgery is performed in case of heart attack as an emergency measure. Heart problems include angina, coronary artery disease etc. Every surgical procedure carries certain risk. These risks depend on the complexity of the surgery and your overall health condition. You may be at greater risk of complications if you have diabetes or problems with kidney function. Since quadruple bypass surgery is performed under a general anesthesia, you may experience some complications after the surgery. The complications related to general anesthesia may include headache, vision impairment, faintness, nausea, vomiting, pain in the muscles, loss of appetite and weight, pain in the stomach, urination problems and sleeping disorders. Complications which are characteristic for any major surgical procedure involve infection of the wound, sepsis, blood clot and chronic pain of the wound. Proper care of the wound until it heals completely is very important in order to prevent such complications. Complications related to quadruple bypass surgery include internal bleeding, irregular heartbeat, heart failure, kidney failure and stroke. You may also develop acute memory loss or your thinking process may be impaired. You will need about five weeks to recover from quadruple bypass surgery. After this procedure you will feel much better because the blood flow has been restored. However, certain lifestyle changes may be necessary in order to maintain healthy heart. Your doctor may recommend a special rehabilitation program for patients who had any kind of bypass surgery. You must also stop smoking and eating greasy food. You should keep your weight normal do moderate exercises and eat healthy food. Regular checkups are also recommended.